Beside the nailing machines, which are of American origin, we admire a machine which marks the stoppers, accounting for 5,000 stoppers per hour, without requiring any attention other than to fill the hopper which feeds it from time to time. The nailed cases are lined up in the vast halls of which we spoke before, there they are branded, rigged, and loaded onto the wagons that await them at the doorway. A hundred cases of 12 bottles can thus be finished in the space of an hour and the number could be well increased if not for the fact that this would make it necessary to enlarge the buildings. From the handling of bottles, we descend into the cellars where new surprises await us. 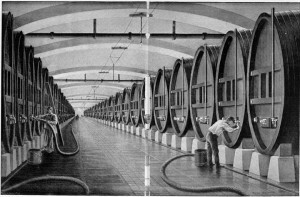 Under these sonorous vaults are aligned in immense perspective the 230 tuns containing altogether millions of liters of fabricated absinthe; 19 large steel vats contain in their bellies the hundreds of millions of liters of proof spirit of wine. A simple move of the tap starts the flow of alcohol to the vats from tank cars brought from Languedoc and Rousillon. Powerful pumps make the transfers, accumulating in a storage room the proof spirit needed to distill or to fill the bottle preparation vats; electric bells, acoustic tubes and whistles transmit commands at the speed of thought and the enormous handling required to move such considerable quantities of liquids is done, so to speak, without even realizing it, by four workers.